SF trainer in Panama explains range procedures to Panamanian counterterrorism security forces in Panama. (photo by SSG Osvaldo Equite SOCSouth, Jan 20, 2018). SOF News Update 20180312 – 2003 JSOC raid into Iraq, intel in corporate world, some great SF photos, USSOCOM and ‘hard problems’, Britain’s WWII GW, conflict in Mali, Kurds shifting focus to invading Turkish forces, MQ-1 Predator to retire, 10th SFGA dietitian, Green Berets and their weapons, ‘own the night’, SERE, early SF history, USAF Reserve CSAR, and more. Podcast – 2003 JSOC raid in Iraq. Modern War Institute’s The Spear presents a 30-minute podcast on a special operations mission into Iraq. Col. Phil Ryan, the commander of the 160th Special Operations Aviation Regiment tells the story. In 2003, Ryan was a pilot in the unit when it entered Iraq at the very beginning of the invasion of Iraq. Listen to “Podcast: The Spear – a 2003 Helicopter Mission Deep into Iraq”, Modern War Institute at West Point, March 7, 2018. Solving ‘Hard Problems’ for USSOCOM. 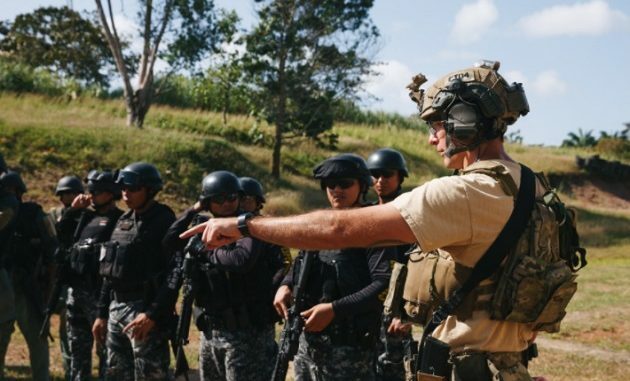 The Special Operations Forces Acquisition, Technology & Logistics (SOF AT&L) organization within the U.S. Special Operations Command is seeking assistance to solve ‘hard problems’ in areas that are of critical importance to the success of mission accomplishment. These areas are small unit dominance, mission assured communications, and signature management. Read more about SOF Hard Problems. Green Berets and Their Weapons. There are several military occupational specialities (MOS) on a Special Forces Operational Detachment Alpha (SFODA). Two members of the team are ‘weapons men’. These guys have the most fun. See “Watch Green Berets demonstrate a lot of cool firepower”, We Are the Mighty, March 8, 2018. MQ-1 Predator Has Seen Its Time. The Air Force is phasing out the famed Predator UAV. Read more by Joe Chapa, a major in the U.S. Air Force. Read “The Sunset of the Predator: Reflections on the End of an Era”, War on the Rocks, March 9, 2018. SERE: “. . . the biggest mental challenge . . .” Tom McCollum left the 82nd to go through Special Forces training. Then he hit SERE training. (Fayetteville Observer, Mar 11, 2018). Britain’s WWII Guerrilla Warfare History. Historian Giles Milton is interviewed about his book Churchill’s Ministry of Ungentlemanly Warfare. Churchill recognized the changing nature of war and allowed a team of independent-minded operatives to operate in the new environment. Read “The Secret History of Britain’s WWII Guerrilla Warfare”, Military.com, March 8, 2018. USAF Reserve CSAR Units Feeling the Pinch. The burgeoning economy and increase in air travel are prompting the commercial airlines to offer very attractive packages to active duty Air Force navigators and pilots. The USAF reserve units are also being affected. Read “Reserve Rescue Aircrews to Air Force: Don’t Forget About Us”, Military.com, March 10, 2018. Early SF History. I was at a fundraising event this past Saturday night talking with a SSG from Special Forces who was manning a static display. One of my friends with me had served with the 77th SFG in the early days. The SSG had no clue there was a 77th and had no real idea on the history of Special Forces beyond what has happened since 9/11. I spent about 10 minutes bringing him up to date. By coincidence I bumped into this article on the Internet! “Becoming Special Forces”, Paraglide, March 8, 2018. ANASOC’s Team Leader Course. The Afghan National Army Special Operations Command conducts a six-week long Noncommissioned Officer’s Team Leader Course near Kabul. Read more (DVIDS, Feb 22, 2018). ‘Own the Night’ – Not as Much Now. As the U.S. continues to provide night vision goggles to our ‘partnered forces’ (in Iraq, Afghanistan, and elsewhere) the insurgents they fight will gradually attain night vision capability. One way this happens is when the insurgent capture the equipment in raids and ambushes. Another avenue is the corruption within these ‘partnered forces’ when the equipment is sold to insurgents. Still yet another way of attaining night vision capability is to buy commercial off-the-shelf night vision goggles. Read more in “How much longer will US and partner forces ‘own the night’ in combat?”, Army Times, March 11, 2018. Conflict in Mali. The Tuareg militias are clashing with the Islamic State-loyal militants in northern Mali. The analysts at Threat Matrix of the Long War Journal provide info on the clashes. (March 8, 2018). 10th SFGA Dietitian. Kelsey Bailey, a Tactical Performance Dietitian for the Special Forces Group based in Colorado, says a good diet starts off at the grocery store. Read “Go Further With Food – Fort Carson Dietitian Leads Commissary Tour”, DVIDS, February 28, 2018. Kurds of Syria Shifting Focus. Kurdish forces are shifting their focus to the Turkish invasion of Kurd-held areas of Syria. This means that the Kurds attention on the Islamic State fighters has lessened in order to confront the more immediate and severe threat from the north. One would think that the SF ODAs in Syria would get an opportunity to hit the weights; but I am sure the Bn CSM / S3 has them busy with other duties and missions. Read “Turkey’s war on Kurds unsettles fronts in northern Syria”, AP, March 9, 2018. Afghan SOF Take Losses in Battle. At least 10 Afghan commandos (some news reports say more) were killed in an ambush in Farah province on March 9th. “Afghan special forces hit hard in deadly Taliban ambush”, FDD’s Long War Journal, March 10, 2018. Afghan SOF Staying Busy. Maj Anthony Mayne, of NSOCC-A, provides a roll-up of recent Afghan SOF operations around Afghanistan. (DVIDS, Mar 9, 2018). Intelligence in the Corporate World. The world of intelligence is not just for three-letter agencies of the U.S. government. Smart application of basic intelligence principles can enable business corporations to understand and adapt to a complex world of dynamically evolving threats and constantly evolving opportunities. Read “A CEO’s Brief Guide to Intelligence: Not Just for Three-Letter Agencies”, The Cipher Brief, March 9, 2018. SF Photos – and Motivation for SFQC. View 30 great photographs from the 1st Special Forces Command Facebook and read some motivational passages targeting the candidate for Special Forces training. (The Chive, March 8, 2018).